A UNICEF worker speaks to a child seeking temporary shelter at a vacant field next to Nepal's army headquarters in Kathmandu following Nepal's massive earthquake. 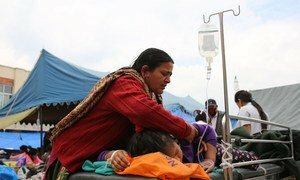 The United Nations relief wing said today that at least 2,200 people have died and over 5,800 are injured as a result of a 7.8 magnitude earthquake that struck Nepal on Saturday. The figures, released by the Nepalese Government Ministry of Home Affairs' National Emergency Operation Center, and included in the latest situation report released by the UN Office for the Coordination of Humanitarian Affairs (OCHA) today are the latest available and are expected to rise as search and rescue efforts continue and the total number of people affected by the disaster is determined. The situation report says that 35 of the 75 districts in Nepal are reported to be affected by the earthquake, with the most affected districts being Dhading, Gorkha, Rasuwa, Sindhupalchowk, Kavre, Nuwakot, Dolakha, Kathmandu, Lalitpur, Bhaktapur, and Ramechhap. Ms. Amos said UN agencies were working with humanitarian partners in Nepal, supporting the Government and other partners. The World Food Programme (WFP) was providing food items, The UN Children's Fund (UNICEF) was sending tents and healthcare supplies and the World Health Organization (WHO) had distributed medical supplies to cover the immediate needs of 40,000 people. She added that a UN Disaster Assessment and Coordination team was on the ground helping to coordinate response effort, adding that the Organization would continue supporting the people of Nepal in the weeks and months ahead. People affected by the earthquake are in need of food, water, emergency shelter and healthcare, with many having slept in the open in makeshift tents for two nights. In a report on the agency's website, UNICEF stressed the heightened vulnerability of children when access to safe water and sanitation was limited and said children may have become separated from their families. The report said staff and supplies were mobilizing to meet urgent humanitarian needs, with a focus on water and sanitation, nutrition, education and child protection. Two cargo flights, with a combined 120 tonnes of humanitarian supplies including medical and hospital supplies, tents and blankets, were being readied for urgent airlift to Kathmandu. Martin Sajdik, the President of the Economic and Social Council, expressed his sadness at the loss of life and sent his condolences to all those affected by the disaster. He stressed that the tragedy in Nepal underlined the need to make disaster risk reduction a critical component of the post-2015 development agenda and to improve mitigation efforts to minimize the impact of such disasters. “The Sendai Framework for Disaster Risk Reduction 2015-2030, adopted recently at the United Nations World Conference on Disaster Risk Reduction, stressed that: 'It is urgent and critical to anticipate, plan for and reduce disaster risk in order to more effectively protect persons, communities and countries,'” he said. He said priorities were assessing the damage, delivering urgently humanitarian assistance and ensuring that development gains are not lost, and he called on the international community as a whole to come to Nepal's aid and focus on long-term recovery. The United Nations Secretary-General has sent his deepest condolences to the Government of Nepal and to everyone affected by a 7.8 magnitude earthquake that struck the country on Saturday.